How To Select Custom Chopper Frames! There is a lot to know about custom chopper frames. It's not simply a matter of saying "I want a hard tail frame". You have a lot of details to consider before you order or design your frame or rolling chassis. Winter is the time that most people decide to perform a build. In most parts of the country it is too cold and the weather is too bad to get much road time in. It's a time for wrenching and getting ready for next spring and all the rallies. It's also a time for building that dream chopper you've wanted for ages. When you design or purchase custom chopper frames, you need to determine the amount of rake, stretch, tubing thickness, neck, width, offset, and other factors before you ever pick up the phone or pencil to begin. Do you want a custom chopper soft tail or rigid or a Pro-street which is long and low soft tail frame? First, let's consider rake on custom chopper frames. If you want a really radical show bike and don't really care about handling on the road, go for a 55 degree rake. But if you want some real road stability and easy of handling, consider no more than 40 degrees. 30 or 35 degrees are considered by many to be the best from a handling standpoint. The higher the rake degrees, the less cornering capability. The longer the front end, the more radical it looks but you lose in that it can be very unruly to handle on the road. 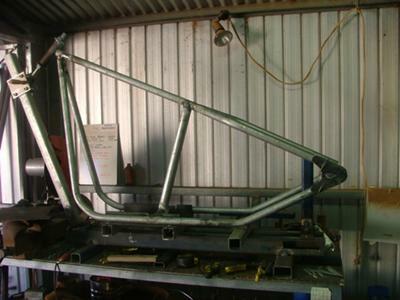 The rigid frame pictured above was built by a subscriber to our chopper mini course by the name of Luke from Australia. Next, think about the frame stretch that you want. If you stretch the backbone 2 to 3 inches and rise it 1 inch up, that can be a great street configuration. That would work well with a 12 inch over front end. The trick is to get the combination just right. If you use too much stretch, you get a bike that flexes a lot on the road. If you go too much up, you get a bike that is only comfortable for a very, very big and tall person. Do some research in this area before you start to find what will be comfortable for you. A little stretch and lift is better than a lot for most people. Neck style is another issue when it comes to selecting or creating custom chopper frames. You can choose the hourglass shaped neck that uses old style fork cups that come with the races already installed or choose a straight neck that you have to install bearing races into. Stock frames have a stress bar from the top motor mount to the bottom of the neck. This adds some strength to the frame and prevents excessive flex. If you plan to use a heavy front end, this bar is a very good idea to plan into your custom chopper. It can also be really handy for hiding the electric wiring between the backbone, tank and stress bar. Speaking of strength, what size tubing do you plan to have your frame built from? 1 1/8 inch provides a good strength, but 1 ¼ is even stronger. The longer the stretch, the more rake and bigger the engine, the larger you want the tubing to be. A strong frame is the basis of a custom chopper that will handle the road well for years to come. Controls – mid controls or forward controls? Make your choice here so that the mounting will be easy later on. Seat mounting is another consideration. If you want a stock seat, the mounting will probably be easy but if you want a sprung saddle, you need to consider this when thinking about the custom chopper frame. 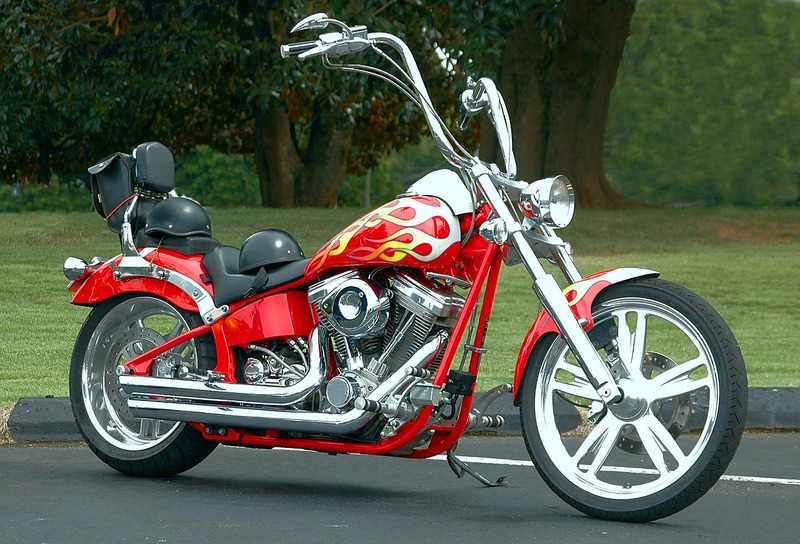 There are software packages available that can help you design custom chopper frames you want and get a good balance between all the various factors. You can also get a lot of advice from bikers who have done this before you. Talk to people who have build custom choppers and learn of any challenges they ran into with their custom frame. Learn from this and avoid making mistakes they warn you about. As you can see, it is not as simple as pointing to a picture in a magazine and saying, "I want that custom chopper frame". It all begins with a visualization of the completed custom chopper, true, but you also have to think about specifics about your body and your riding style before you run out and grab a custom chopper frame. Finished Project (below): ﻿Hardtail Custom Chopper built by Tom Bain in Nevada. Also, I know you will want to keep informed and find good deals. Our custom motorcycle frame building mini course is a free course that will show you pitfalls to avoid, and it's got all kinds of custom chopper tips, stories, pictures, special deals, and more. Click here to sign up for it now. Don't delay or procrastinate in signing up. You won't be disappointed. 9 Problems Metalworkers Face When Building A Custom Chopper Frame And How To Overcome Them! A Special FREE Mini Course.